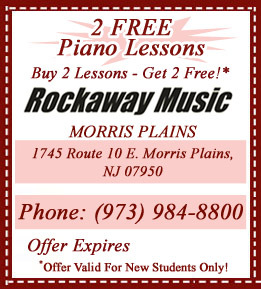 Rockaway Music offers one-on-one piano lessons in the Schooleys Mountain, NJ 07870 area, for children as well as adults of all ages. For your convenience, our piano school operates every day of the week except Sunday. Our piano instructors near Schooleys Mountain, NJ have extensive music backgrounds and teaching experience in the music field. Whether you are a beginner taking your first piano lesson or you have been playing piano for years, our professional piano teachers in the Schooleys Mountain, NJ area will accommodate your needs during your private piano lesson. If a beginner comes to us, we will sit down with him/her and discuss what the student hopes to achieve and what their goals are. We also want to know where their interests lie. Do they like classical music? Rock? Something in-between? Our piano teachers in Morris County will find all this out in the initial consultation. When advanced students come to our Piano School in the Schooleys Mountain, NJ area, our piano teachers will evaluate their current skill level and discuss where they want to end up at the lessons' end. We do consultations and evaluations with both beginner and advanced students. The main difference between beginner and advanced piano instruction is in the piano study materials that we use. No matter what kind of student we instruct, our main goal is to help him or her reach their goal. All of our piano lessons are provided in our private piano school near Schooleys Mountain, NJ. We want to provide you and your family with quality, music education in a comfortable, professional environment. For more information on scheduling and our lesson program of piano lessons in the Schooleys Mountain, NJ area, please give us a call at 973-984-8800 or email us at contactus@rockawaymusic.com.